Airborne LIDAR Committee: This committee develops best practices by soliciting input from the broad airborne laser scanning industry and from academia. Best practices are disseminated in both working papers and more formal specifications (such as the Vertical Accuracy Specification). Mobile Mapping Systems Committee: This committee is a parallel committee to airborne but with the focus being land/water based kinematic laser scanning systems. LAS Working Group: The LAS Working Group maintains and updates the LAS kinematic laser data standard. The increasing use of laser scanning technology has identified a need to establish professional practices and guidelines covering the proper planning implementation data processing and QA/QC of laser/lidar data in various mapping projects. Further adoption of ALS (Airborne Laser Scanning) and TLS (Terrestrial Laser Scanning) technologies by data users and mapping practitioners requires common data exchange formats sensor calibration routines uniform data analysis and accuracy assessments. The ASPRS decided to form our group of interest. Its first meeting was held on November 3 1999. The ASPRS LC has several initiatives underway in conjunction with sensor manufacturers data providers and data users to address these issues. At our annual meeting in Portland 2008 several committee members volunteered their time to generate best practice documents for review (see April 29th 2008 committee meeting minutes). So far documents relating to accuracy assessment frameworks lidar point spacing definitions and lidar sensor calibration have been submitted. Feel free to download and review these materials and send your feedback either to the authors directly or to the current Airborne Lidar Committee Chair. 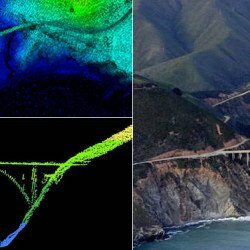 The American Society for Photogrammetry and Remote Sensing (ASPRS) is pleased to announce LAS 1.3 a new release of the open file format for lidar data storage and delivery. ASPRS has been maintaining and updating this widely used specification since its inception at the beginning of this decade. The 1.3 release adds support for waveform encoding of laser returns. The encoding of this new data extension is optional allowing LAS 1.3 to be used as the specification in normal multi-return delivery products. The LAS version 1.3 specification was approved by the ASPRS Board of Directors on July 14 2009 and is available for immediate use. The current version of the full specification together with superseded or suspended versions, can be downloaded from the ASPRS Standards Committee LASer (LAS) File Format Exchange Activities page. An integrated system of sensors such as laser scanners digital cameras position/orientation resolvers pavement sensors ground penetrating radar etc. that collect multi-sensor data while the platform [land or water vehicle] is in motion. as to warrant a separate committee. Mapping that this new committee will be equally popular useful and successful. The inaugural meeting was held at the spring 2010 ASPRS Annual Conference in San Diego California. The LAS Working Group (LWG) maintains and updates the LAS kinematic laser data specification. Most recently they have completed work to draft the LAS 1.4 specification and will soon begin development of LAS 2.0. For more information on LWG activities see LASer (LAS) File Format Exchange Activities.